On March, 1942 our first Soil Conservation District, which included the nine eastern townships, was organized in McLean County, On May 8, 1942, an election for five directors was held. Frank Hubert of Saybrook was elected chairman; Charles Richardson of Ellsworth, vice-chairman; Byron Kline of LeRoy, secretary; E.D. Hess of Arrowsmith and Harry Miller of Saybrook, directors. This group, with the assistance of Ernest Walker, Extension Specialist, P.E. Cooley and H. W. Turner, of the Upper Sangamon Valley Conservation Association and O.L. 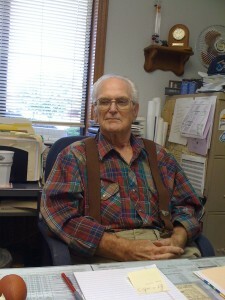 Welch, Farm Advisor, met on May 20, 1942 and worked out a district program. 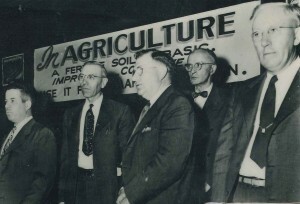 On August 3, 1942, a Memorandum of Understanding between the directors of the McLean County Conservation District, State of Illinois, and the Soil Conservation Service, United States Department of Agriculture, was completed and signed. Clinton Morgan was assigned by the service to assist the directors in the program adopted by the District. 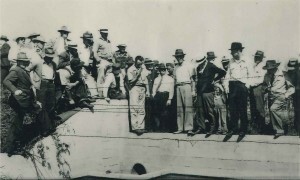 A similar meeting was held August 8, 1942, and the services of H.W. Turner and Harry Beeson, Conservationist of the City of Decatur, were made available to help in the Sangamon Watershed. Soon after the District was completed, plans were under way for the organization of the entire county into one district; it comprised thirty townships and over 747,000 acres of agricultural land. This was accomplished in May of 1944. Now that the whole county was covered by the District, promotional activities greatly increased. The climax of the year was on September 7th when four conservation tours were held simultaneously, followed by a banquet in the Bloomington Consistory. Ollie E. Fink of Columbus, Ohio, Secretary of “The Friends of the Land” was the speaker. Seven hundred and fifty people from all walks of life were in attendance. 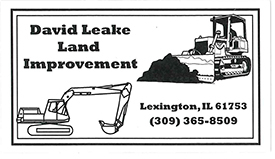 This event was certainly one that helped bring about a consciousness of soil erosion and the importance of soil conservation to the minds of many people in McLean County. In 1945 soil conservation was presented to all the teachers of the district at County Institutes, so they might acquaint the children of the county with the conservation movement, thereby growing up to accept conservation as a way of life. By 1947 the need for getting specific detailed information to large numbers of farmers was so great, that the practice of neighborhood group planning was adopted. Local groups of farmers were formed and one farmer acting as its leader. Many rugged discussions and many hours were spent by our Conservationists, Assistant Farm Adviser, and directors in meetings throughout the county for the next several years. The group leaders were called upon time and time again for direction and help in planning and application of conservation practices on the land. In 1948 the directors, newly appointed assistant directors. Soil conservation technicians and the Farm Adviser made a tour of the county to observe practices applied to the land. A school of instruction for Agriculture teachers was held where contour staking and grass waterway construction was taught. These teachers and their students staked over 1100 acres of contour lines in 1948. The directors took part in several radio programs. The Field Day honoring Frank Bill, Farm Editor of the Bloomington Daily Pantagraph, demonstrated terrace building, contour staking, tiling, waterway instillation, and concrete dam construction. In 1949 the District was awarded first place in the Goodyear awards program. During 1950 and 1951 the District sponsored an air lift. One member of each county 4-H club and FFA Chapter was a guest of the air lift, the purpose being for him to report to conservation to his respective group. During 1951 the U.S.D.A. took steps to coordinate the various agencies that operate under its jurisdiction. In 1952 the District cooperated with the Pantagraph as host to the State Contour Plowing contest, an estimated 15,000 people attended. Many demonstrations in construction of conservation practices were held. The Money Creek pilot watershed project was started. In the spring of 1953 C.C. Morgan, who had served the District since its organization, resigned to go into business. In the fall of 1953, Ed Schramm was transferred from Kendall County to this district to serve as Work Unit Conservationist. In 1954 the directors met with the County ASC, the SCS personnel and the Farm Adviser in working out an agricultural conservation program to get more real conservation on the land. The result was a program emphasizing each practice in a direct ratio to its importance to conservation in our district. Wide base terraces, contouring, and grass waterways were given both technical and cost sharing priority. 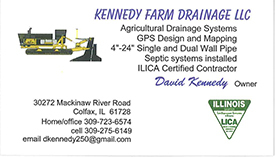 A brochure worked out in cooperation with the above group was made up and mailed to every farm owner and operator in McLean County. Mr. Walter Bode won the state speaking contest sponsored by the Spencer Chemical Company. Bankers of the county bought a disk tiller for building terraces. The County Board of Supervisors appropriated $500 for conservation. In 1955 the first terraces put on at an Illinois State Farm were built at the Soldier’s and Sailor’s Children’s School Farm on the annual Pantagraph Soil Day. Friends of the Land and the Northern Illinois Chapter of the Soil conservation Society of America both met in McLean County. These groups, the A.S.C. personnel, and the lady landowners were taken on separate conservation tours. The City of Bloomington gave conservation a real boost in 1956 by providing $2400 so that the district could hire a secretary-receptionist. Financial assistance has been continued, the cost now, however being borne jointly by the city and the county. 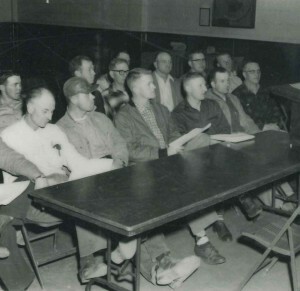 In 1957 the Association of Illinois Soil Conservation Districts held its annual meeting at I.S.N.U. Some 220 local people not directly connected with the association attended the meeting. Rev. W.H. Stauffer of Suger Creek, Ohio appeared before the group and has since been asked to speak at over 75 conservation meetings in Illinois. In 1958 the district built 50 miles of terraces, approximately 10% of the new terracing in the state. Keystone Steel and Wire recognized us as the outstanding district in the state by producing “Modern Pioneers of McLean County”, a color-sound movie which is still available for showing. In 1959 we were again eligible for the Goodyear Awards Program, and because of the conservation work by farmers of McLean County, we again won. Our annual report that year contained an edited version of ideas and opinions from districts all over the state. The big three are terraces, contours and waterways. Here the squeeze is really on. Economic conditions have really created a demand for these practices; at the same time greatly reducing the time when these practices may be applied. There is sufficient time to apply these practices when the rotation contains plenty of grass. But with this artificial demand, caused by economic factors, requiring practically continuous row crops, there are not enough minutes between corn harvest and freeze-up to do the job. Three years ago when we stopped staking out tile drains for farmers, we promised that this would result in an increasing use of this practice. For the second year in a row, there has been a very substantial increase in this drainage practice. This is a good example of the policy of the Soil Conservation District. When private enterprise is ready and able to take over a job, we are most happy to encourage it to do so. In recognition of the importance of water conservation, the Soil Conservation District in 1961 changed their name to include Water. Actually the practices that hold and save the water where it falls are the ones we have been stressing for years, for it is only when you prevent the loss of water and soil by the same act that it can be done profitably. Contouring application peaked in 1962 with a record of 10,000 acres. By 1964 the McLean County Soil and Water Conservation District became alarmed at the loss of contouring and pointed out in their annual report, the need for the development of a stubble mulch practices under ACP. 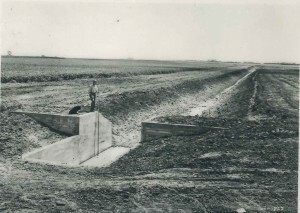 In 1965 the McLean County Soil and Water Conservation District passed another milestone. The number of heavy earthmoving machines operating on a given day (20 plus) is so great that the SCS personnel have problems just keeping ahead of them. We have received permission to let qualified contractors do their final check and have them furnish the SCS with a copy of the final check notes. During 1967 it seemed the most effective method of conservation tillage required a chisel plow, a large heavy disc and aggressive corn planter with an effective marker, a pre-emergence spray and a big tractor with plenty of traction. Many felt that chisel plowing was relatively effective in controlling soil and water losses and practically eliminated erosion. In 1969 there were two projects involving the McLean County SWCD that did not fit easily into the success or failure category. The first was the Kickapoo flood control project, usually referred to as a 566 project, which was a failure. The second project was a success. It was the installation of a parallel system of terraces with tile outlets usually referred to as a PTO system. The Directors of the McLean County SWCD found themselves having to deal with the pollution problem. They realized that “this time” protecting the environment was not just a passing fancy. Directors were willing to have the responsibility of the SWCD widened. 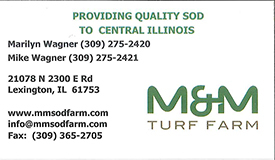 In spite of our concern with parks and timbered lands, the main job of the McLean County SWCD is with the cultivated lands of the country, particularly those with over 2% slope that are subject to excessive erosion if not properly managed. On July 1, 1972 the SWCD’s in Illinois were asked to review all significant land use changes within their District and express their opinions to the proper authorities as to the effect the changes will have on the environment. The District was involved in reforestation of the county parks and Evergreen Lake. Sometime in the early 1970’s, the chisel plow surpassed the contour row as a means of controlling erosion in McLean County. Chisel plowing, like contouring, even when used in conjunction with terracing, has its limitations. 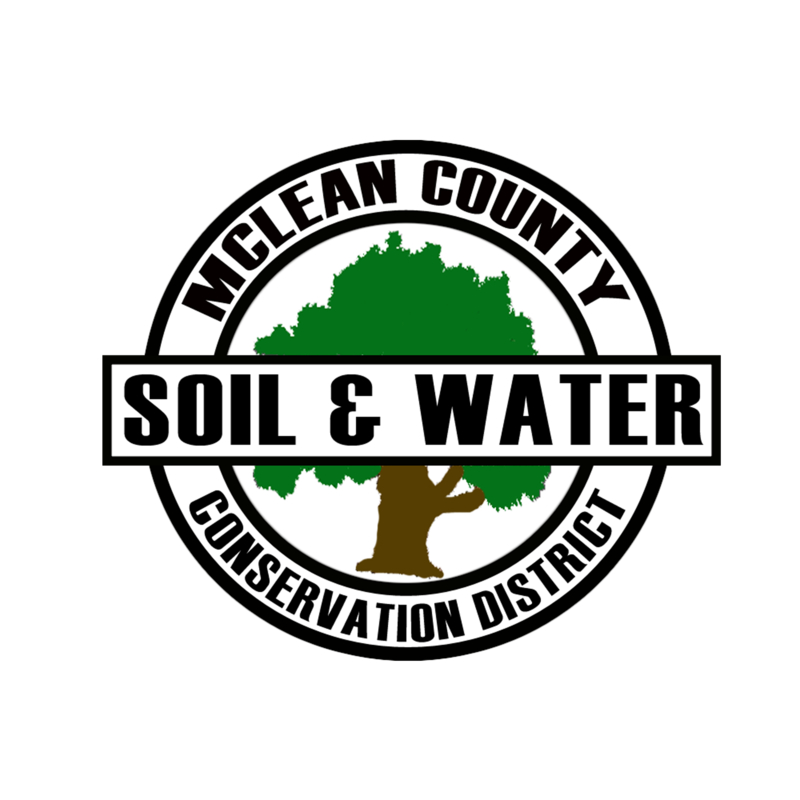 For McLean county Soil and Water Conservation District to carry out its responsibilities and procedural guidelines by Federal and State legislation, it became evident there was the need for a Soil Survey in McLean County during the mid 1970’s. On August 1, 1977 the District adopted the major priority of providing assistance to district cooperators for erosion control in sloping cropland. Later in the year priorities were extended to include the use of aerial topographic mapping, long term agreements and sub-priority of a campaign approach to conservation tillage at controlling erosion on sloping cropland. Priorities in McLean County consist of soil erosion control, preservation of prime farmland, water quality improvement and soil survey. Mike Rahe was hired as the first temporary Administrative Aide/ Resource Conservationist by the SWCD. Mike became a full-time employee in 1983. He concentrated his efforts towards conservation education and supplying technical assistance to county farmers. In the spring of 1981 the District held their first annual tree sale. They sold over 10,000 trees to residents of McLean County. Another major fundraiser for the District began in 1982, the annual spring fish sale. The first newsletter was published in 1983. 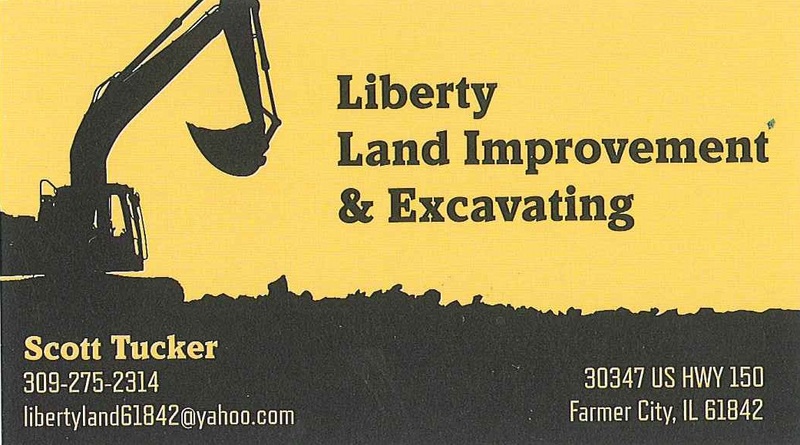 It will be used to keep landowners and cooperators informed of happenings and accomplishments of the District. Tillage became an important issue in the 1980’s, which lead to the formation of the No-till Club (which was the first in the state) in December 1980. The clubs first meeting had 40 farmers in attendance. Outstanding Conservationist in McLean County was presented to Jim L. Rutherford in 1984. In November 1984 the SWCD developed “T by 2000” strategies to meet state erosion and sediment control guidelines. 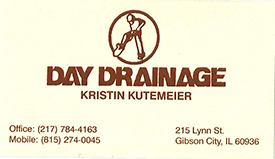 Kent Mason becomes Resource Conservationist in McLean County in 1985. On January 15, 1985 the Mclean County Board made a benchmark decision to approve and adopt a modern Soil Survey for the county. LESA system was adopted by McLean County Regional Planning Commission and the District. It will be used to supply information to county government for land use decisions. Paul Osman began as Resource Conservationist in 1985. The 1985 Farm Bill required FSA plans on all Highly Erodible Land. The conservation Reserve Program was also introduced in the same bill. In 1986 McLean County Chapter of Pheasants Forever donated an 8 ft. Brillion seeder to the District. The seeder will be available to any cooperator wishing to establish wildlife habitat acres. In June 1989, 57% of Mclean County had been mapped by the Soil Survey Crew. Jane Brown began as Resource Conservationist in 1989. One year ago the Soil and Water Conservation District, Soil Conservation Service and locally developed Soil Survey committee began on a journey that would change the way people looked at and managed McLean County’s most important natural resource- it’s SOIL. Several months of preparation, presentations and deliberations went into one of the biggest single accomplishments made in McLean County, perhaps the biggest in nearly 50 years of Soil and Water Conservation programs in the county. On January 15, 1985 the McLean County Board made a benchmark decision to approve and adopt a modern Soil Survey for McLean County. 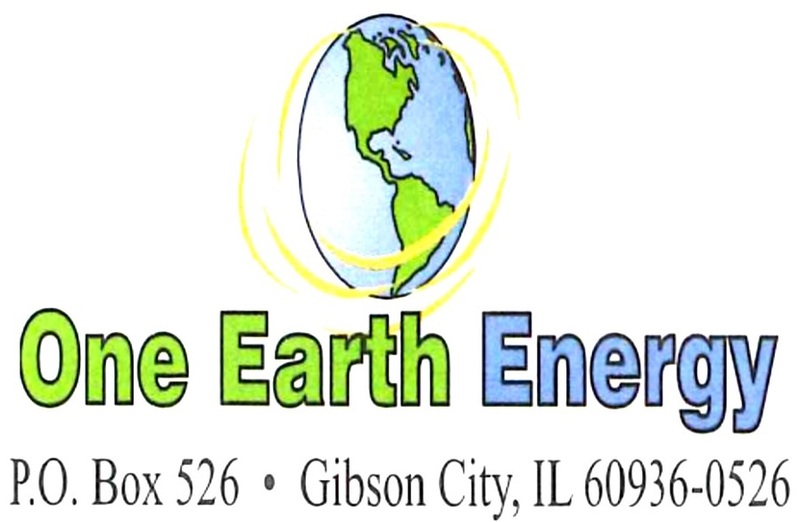 Per the soil survey cooperative agreement the USDA will fund 50% of the project for an estimated total of $600,000, the State of Illinois will fund 25% for an estimated total of $300,000, and McLean County’s share is 25% for an estimated total of $300,000. With soil scientist staff on line for fall 1985 the mapping will take approximately 5 years, but the benefits will begin occurring with the first acre mapped and every acre thereafter. A sincere thank you to all the people, groups and agencies that supported and helped McLean County achieve a modern soil survey. McLean County Chapter of Pheasants Forever donated a tree planter to the District. 4,850 white pine trees were given to school children and groups in celebration of Arbor Day and the 20th Anniversary of Earth Day. In 1990 Gary Fak, District Conservationist for McLean County transferred to Trenton, Missouri as RC&D coordinator. The Final Acres Ceremony of the Soil Survey was held November 27, 1990 to celebrate the completion of the soil mapping of over 750,000 acres in McLean County. Jackie Killian began as Resource Conservationist for the District in 1990. The Lake Bloomington Watershed Agreement was signed on January 30, 1992 between SCS, DNR, SWCD and the City of Bloomington. The multi-million dollar project will consist of two sediment control structures. The structures will be designed to hold silt, developed wetlands and improve water quality. The wetland inventory in McLean County started in January 1991 and took 3 ½ months to complete. Jim Rutherford retired from SCS after 37 years of service to McLean County. 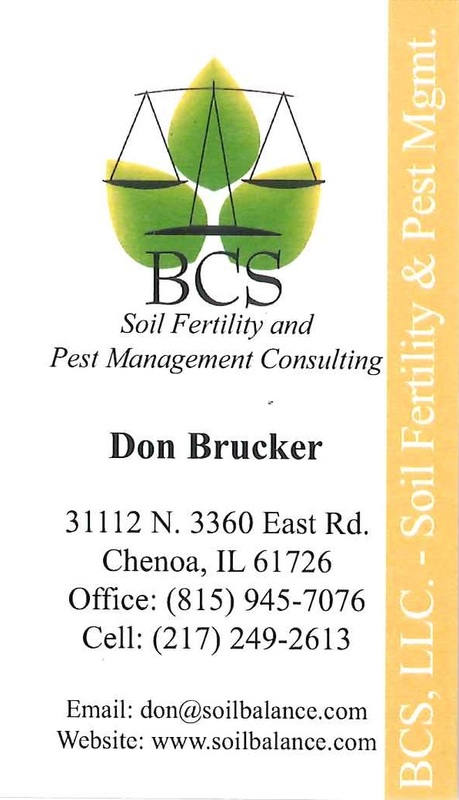 He will serve as Watershed Soil Conservationist for the Lake Bloomington Watershed Project. The District began offering a fall fish sale to people interested in stocking farm ponds. Ken Benjamin, past board member, initiated the 50 year history of the McLean County SWCD. A committee was formed to guide the District during this project.